Summary: This is one of the Northern Pennines classic walks with the goal being to High Cup Nick waterfall and High Cup, one of Northern England's geological wonders. 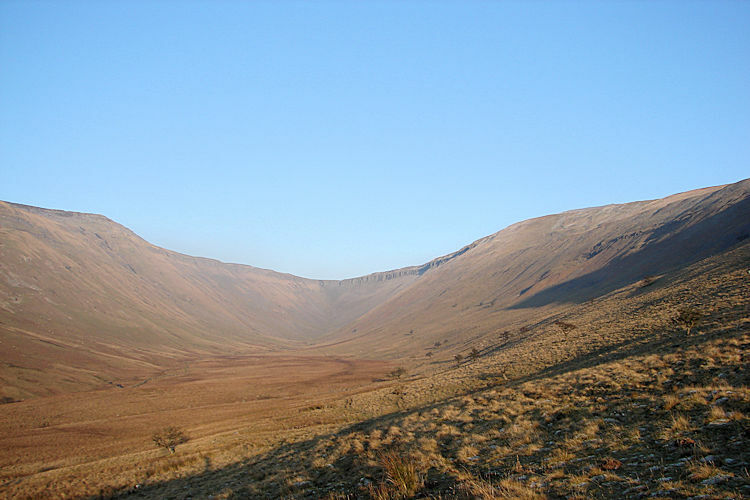 High Cup is a classic U-shaped glaciated valley high on the western flanks of the North Pennines. 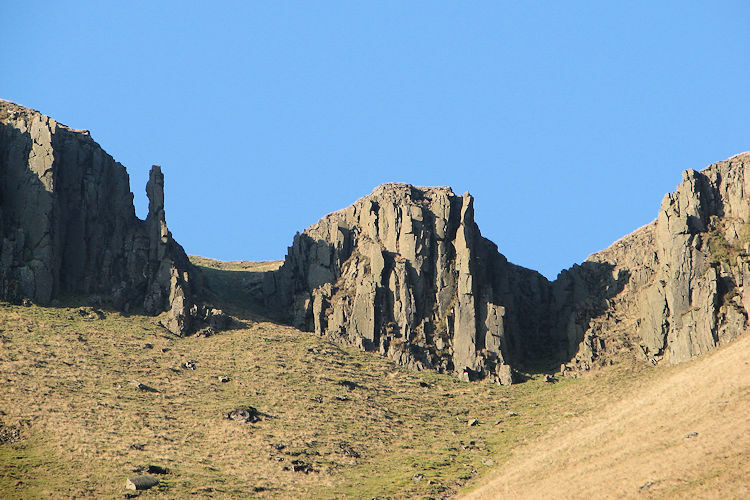 A deep chasm on the Pennine fell side resembling a scar that could have been caused by a meteorite this famous place is a dramatic geological formation and part of the well-known Whin Sill. 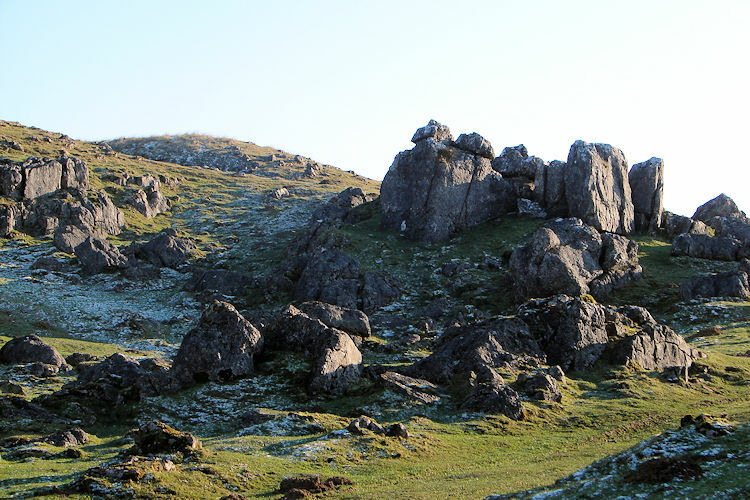 Formed by the sturdiness of grey-blue dolerite the crags are spectacular. 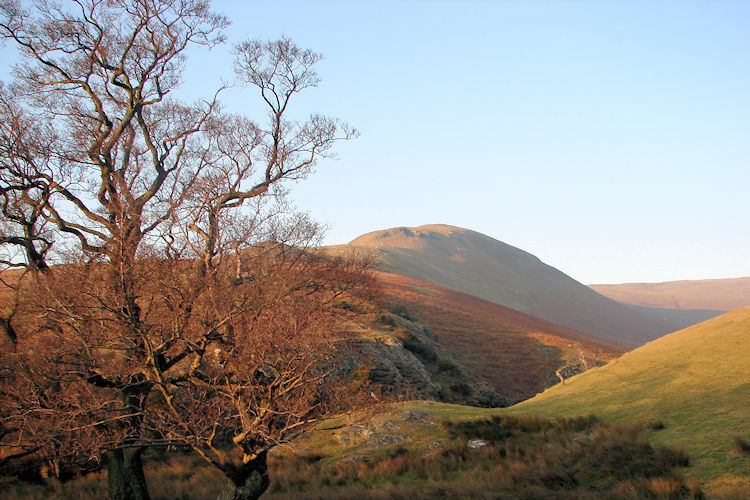 High Cup is on the Pennine Way and can be reached from Cow Green on the border of Cumbria and County Durham, or as this walk demonstrates, from Dufton in the Eden Valley. 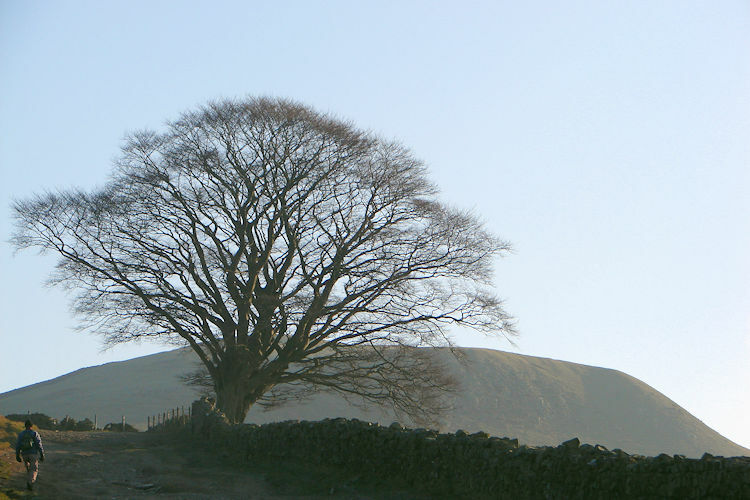 The Walk: There are a select few walks in the North of England that I have not yet done (written December 2008). 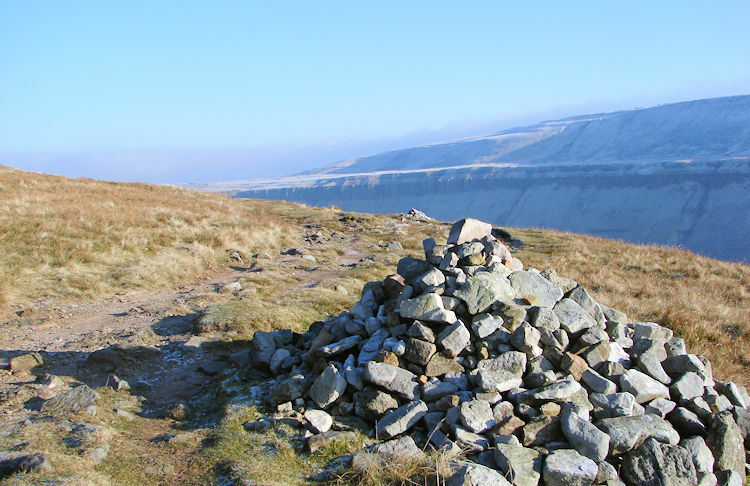 Pendle Hill in Lancashire is one, Cross Fell and High Force in the North Pennines, and the Cheviot being amongst the others. High Cup Nick was high up on the list with them, but not any more for this report is a special one on the day I finally got to walk one of the most spectacular walks in all of England, a walk in magnificent North Pennine scenery to one of the greatest geological features in all of England. What was most gratifying of all was the weather for I did the walk on the penultimate day of 2008 in beautiful crisp winter sunshine. Breathtaking. The shortest day of the year was just one week past so it was an early start to the day but one that was necessary for a number of reasons, the daylight available being one and to walk off some of the Christmas excesses being another. My wife Lil and brother Dave accompanied me on the walk and their company was another delight to enjoy on this great walk. Only once did Lil mention "pointless walk" but that was said in jest and not at all in intention although she was to become a little perturbed later into the walk. More on that in due course but back to the events of the day. We drove over to Dufton from Harrogate via the A1 and A66 and as we knew it was a tough start to the walk we had prepared by enjoying breakfast in Appleby before the start of our final 2008 expedition. We reached our starting point and put on the boots and walking clothes in a convenient parking place just onto the Town Head Bridleway in the south of Dufton village. 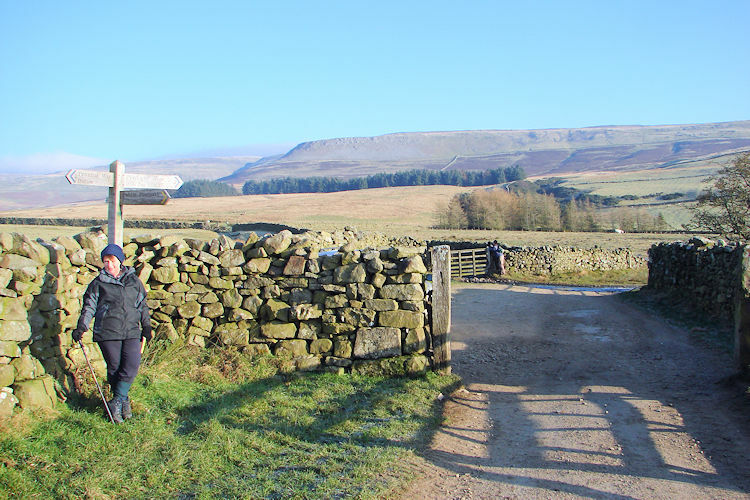 It was the perfect spot right at the start of the walk and we were ecstatic for the mist and cloud that had accompanied us on the car journey was now all gone and in its place we had glorious unbroken winter sunshine beaming down from a lovely blue sky. 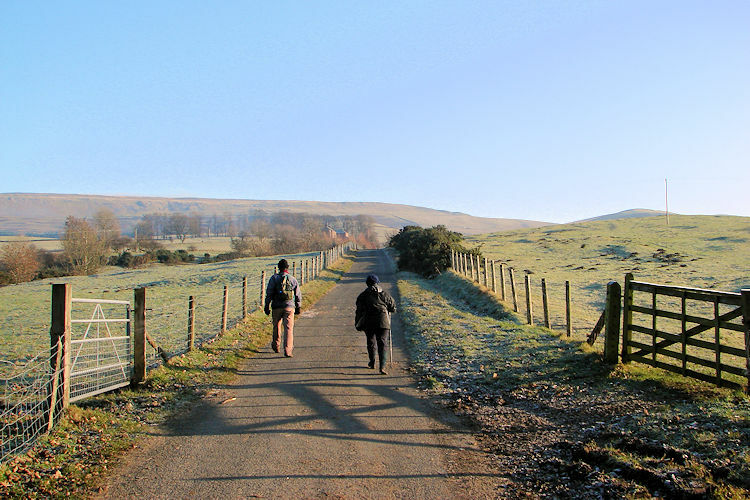 We set off eastbound to follow the bridleway past Bow Hall and towards Peeping Hill. Walking was carefully done for all the wet on the bridleway had frozen to become a difficult ice track. It was cold but dry and bright and much better than a wet drizzly day, that was for sure. The first hour was tough going, especially for Lil who soldiered on slowly but surely up onto the higher ground. All the way had been uphill for the first two miles with over 350 metres of climbing done before we levelled off at over 500m high just after Peeping Hill. 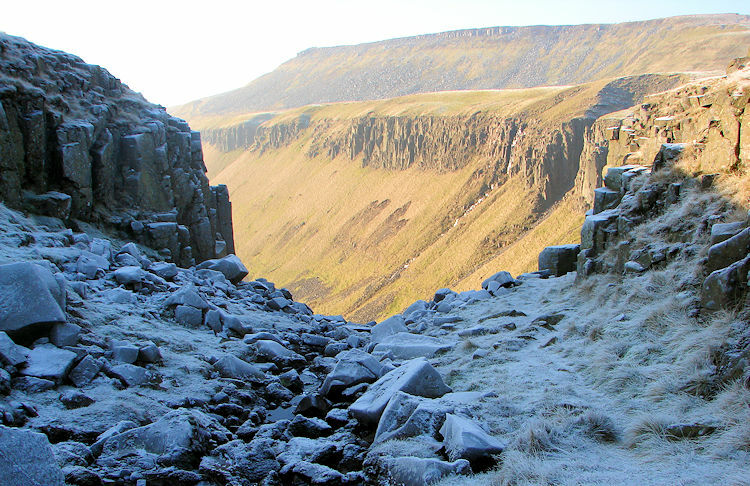 Lil dropped to the ground at a cairn just as High Cup Nick and the resulting gorge came into view. She was jiggered, Dave and I were challenged too. 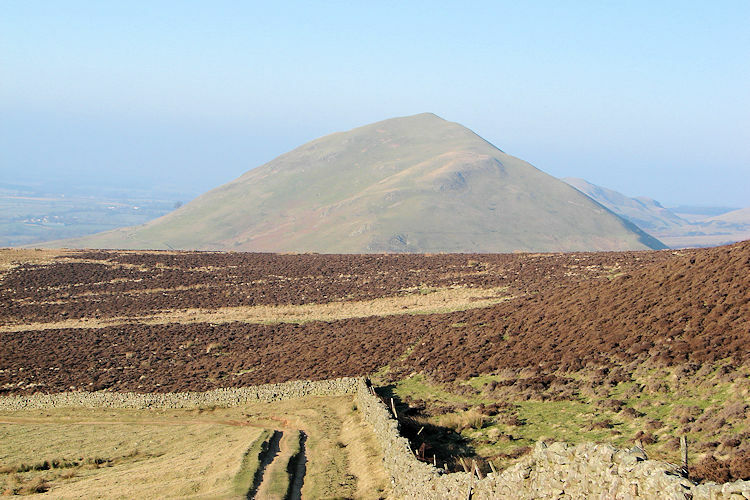 The stiff climb up to higher ground had immense benefits though for the views to hills such as Dufton Pike and Murton Pike were tremendous. 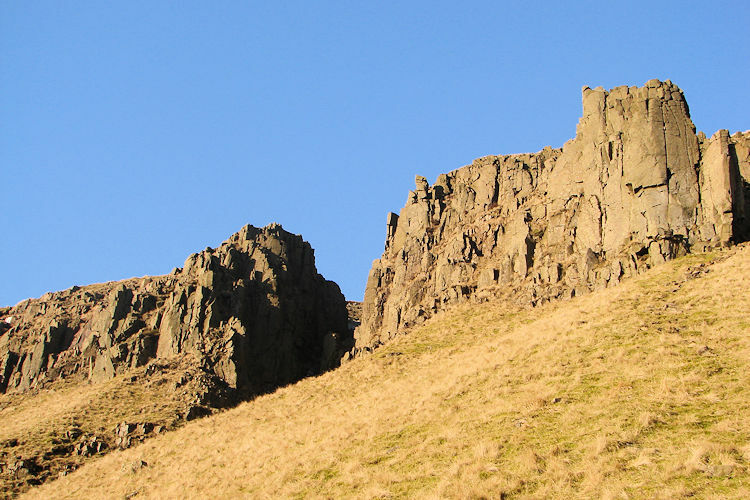 Note - I kept looking at the Pikes noting how similar they are shaped and how I must climb to the top of them both soon! 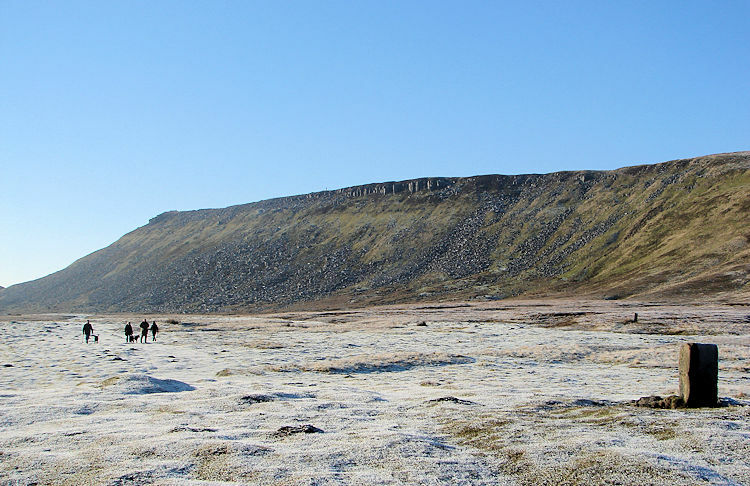 We had levelled off now and the walk along the northern edge of High Cup was undulating, little climbs and little descents with no appreciable effort required. Just as well, Christmas had taken its toll on the stamina levels. Lil took some time out to walk over to some ponies and chat with them. They were very friendly, most accommodating to her and a distraction from the efforts she had taken and more so those that were to come. 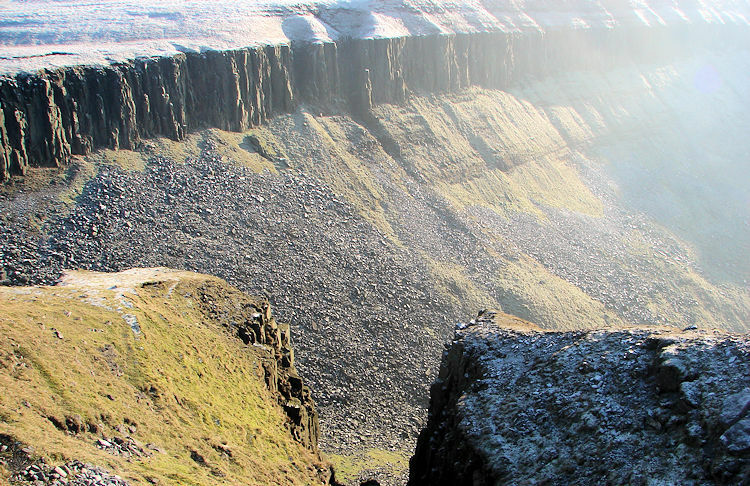 It was at High Cupgill Head that a rocky descent had to be negotiated if we were to bottom to High Cup Beck. That was our way back. High Cupgill Head is an iconic place, the root cause of the deep fissure that is High Cup Gill and I could only imagine what it must have been like in more dramatic geological times. 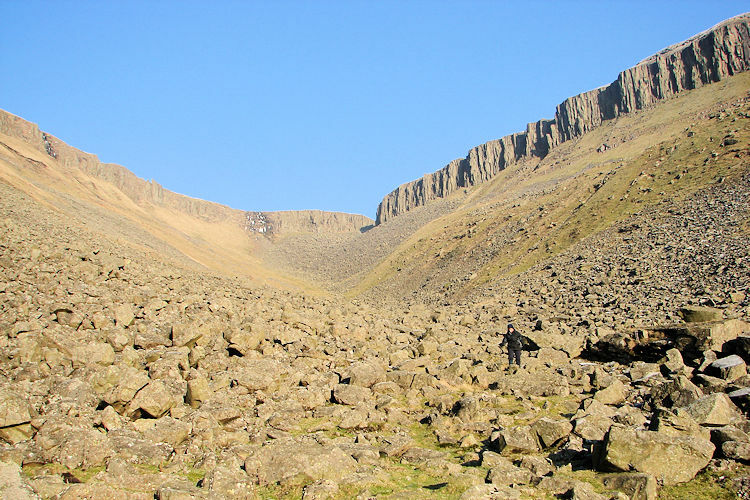 Boulders were strewn all from High Cupgill Head into High Cup Gill and we had to gingerly negotiate our way through the strewn boulder field to the bottom of the chasm. Dave led the way, a man renewed in walking vigour following recent running repairs to his frame and I followed while not forging too far from Lil who found the descent arduous. "Why do you always make it difficult" she exclaimed. "Not my intention" I replied, hoping for a smile. Only at the bottom of the boulder obstacle course did I get one. After the strenuous effort of descent we paused for a lunch break. It had been a tough descent for sure and although the rest of the walk, preceding and following, was not difficult this section does need some care to be taken. After our lunch break there was another shorter and flatter boulder field to negotiate before we got to the opening out of High Cup Gill and the beginning of High Cup Gill Beck. We followed High Cup Gill Beck downstream all the way out of High Cup to Harbour Flatt, not entirely by its side though as we tracked up close to Middle Tongue which afforded us great views of nearby Murton Pike. 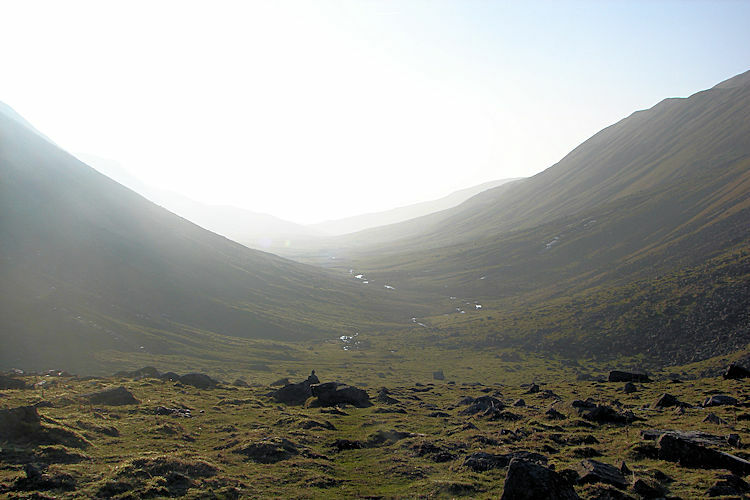 The walk out of the glaciated valley had been a special experience and I was a little sad as I left it behind. I think we were all thrilled by what we had just experienced at High Cup Nick and within High Cup. The timing had just been perfect because we reached Harbour Flatt with about 45 minutes daylight left, just sufficient for us to walk the final mile and a bit along the very quiet road between Murton and Dufton. 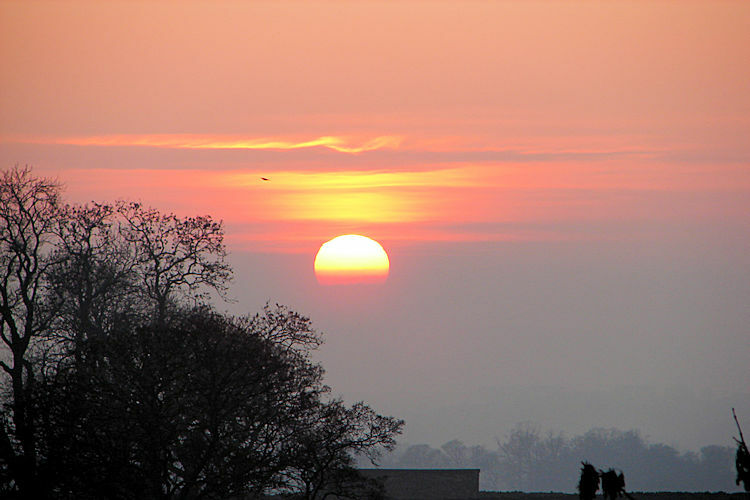 On this final section the sun was setting making the surrounding countryside a beautiful ruddy red. Lil and I passed the time on the road by chomping through the last of the sandwiches and some Chocolate biscuits given as a Christmas present which served to satisfy two purposes: 1) We were hungry and 2) They were now all gone which was a good thing. Dave, Lil and I had a brilliant walk on a brilliant day. One sadness was that it was the last walk of 2008 but then there was always the walks of 2009 to look forward, whatever they were. Pendle Hill? 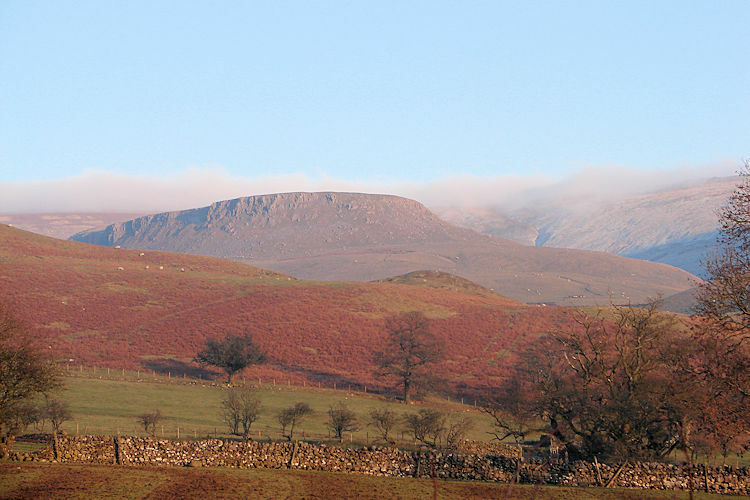 Cross Fell? 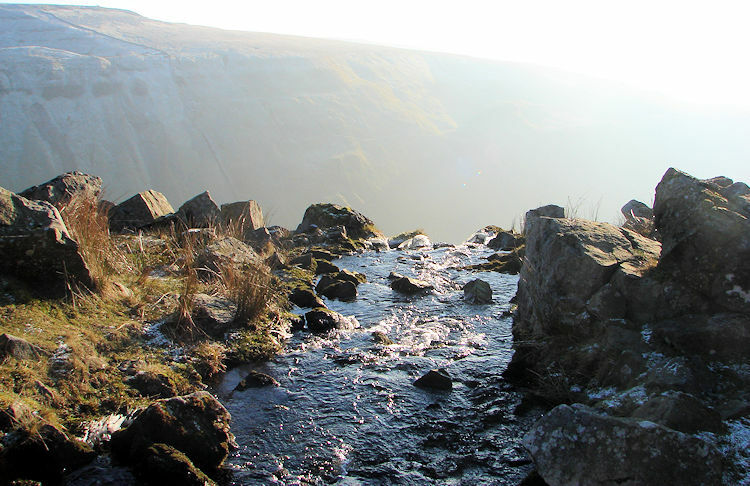 High Force? Cheviot Hill?